Olympics is a quadrennial sporting event which is a holy grail for athletes around the world. As Summer Olympics have taken off in London, I would today be discussing some of the most asked questions related to the event, which serves as the ultimate test of athlete’s mental and physical toughness. Nearly all the countries in the world are represented in the Games. With the expectations of their countrymen on their shoulders, athletics sweat it out to win the ultimate goal of winning a medal for their country at this sporting event. Olympic Games are a reflection of changing society and psychology of people. Though they are, sometimes, a reflection of political situations around the world but at the same time it is the celebration of togetherness and human power. With this let us answer few of the frequently asked questions (FAQs) related to Olympics. When and where did the Olympics start? They first originated in Ancient Greece widely accepted year is 776 BC. They were help in the city of Olympia, hence the name Olympics. These games were help between various city-states and kingdoms which were present in those times. During the Games all the battles or conflicts were postponed, until the end of Games. Ancient Olympics too, were once in four years event and are said to have been discontinued from 393 AD. What were the events in Ancient Olympics? During those days the sporting events featured were running events, discus and javelin throw, various types of wrestling, jumping events, horse riding. Who was the First Olympic Champion? Legend has it that Coroebus of Elis became the first Olympic Champion. He was baker by the profession. He got olive branch as a reward. During those days as is today the honour of winning was more important than the reward. Champions of those times were immortalised by poems and statues. From when the Modern Olympics started? 1896 was the year when the Modern Olympics were held under the patronage of International Olympic Council (IOC). They were hosted in the Panathenaic stadium in Athens. In all fourteen countries were represented by 241 athletes in 43 events. Next Olympics were held in Paris. 1900, Paris Games. This was the first time women participated in the Games. What are the different forms of Olympics? * Summer Olympics : These are held every 4 years and were officially started from 1904, St. Louis, United States. Around 300 events are covered in these Games. * Winter Olympics : They started from the year 1924 and were hosted in Chamonix, France. Various winter sports are covered in these Games. They have never been hosted by a southern hemisphere country for obvious reasons. * Paralympic Games : These Games take place few days after both Summer and Winter Olympics and involve athletes with physical disability. These started from 1960, Rome, Italy. * Youth Olympic Games: These Games were started from 2010, Singapore and involve athletes within the age group of 14-18. 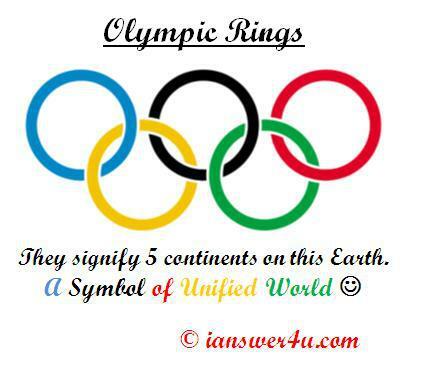 What do Olympic Rings Signify? The five different coloured interlinking rings are official symbol of Olympics and they represent unity in five continents ((Asia, Africa, America, Australia, Europe). The Olympic flag was adopted in 1914. The Olympic motto is Citius, Altius, Fortius, a Latin expression meaning which in English means "Faster, Higher, Stronger". It is one of the symbols of Olympics and has its origins from Ancient Games, where flame was kept burning throughout the Games as fire had divine cultural association and was thought to have been stolen by Prometheus, who in Greek Mythology is credited for creation of man. Torch relay was started from 1936 Games. Now days Olympic Torch is ignited few months before the official start of Games at the original site of Olympics in Olympia, Greece and then is transported to host city through Torch Relay which ends with the opening ceremony. So while you all are cheering for your favourite athletes this Olympics, don't forget the message of Love and Unity that this event conveys. Boxing event in London Olympics is marred by controversial decisions by Judges. Badminton also has its own share. Hoping everything will be smooth in next days. Thanks for these useful information.